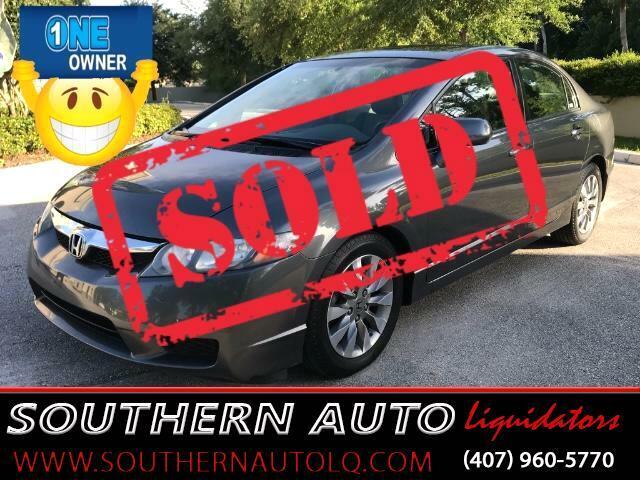 You are looking at a ***ONE OWNER*** Galaxy Gray Metallic 2009 Honda Civic EX-L Sedan. For 2009 Honda Civic got a freshened look with a new bumper and grille up front and new headlight and taillight color combinations. The Civic continues to hold its position at the top of the highly competitive compact class, thanks to innovative styling, refinement and Honda reliability. The Civic comes standard with side-impact airbags and other safety features such as Vehicle Stability Assist, which is Honda's name for electronic stability control. We like driving Honda Civics because we find the ride quality solid and firm, with less road noise and wind whistle than is common for the class. The exceptionally stiff chassis gives the Civic a solid and planted feel. The brake feel is solid as well. Thoroughly modern front and rear suspension designs deliver impressive stability and certain steering response. The long wheelbase smoothes the ride. The EX-L is the more luxurious model with added features such as: USB Audio interface, leather padded armrests, and heated leather seats. This 09 Civic EX-L also comes featured with: Cruise Control and audio buttons on the three-spoke wheel, Sunroof, Ice Cold A/C, and AM/FM/CD/USB Radio. We love the new sleek look of the 09 models and the drive is unmistakably “Honda”. So smooth, responsive and Honda reliable. Come by today. You won't be disappointed!!! Drive Fun, Drive Safe, Drive Cool.